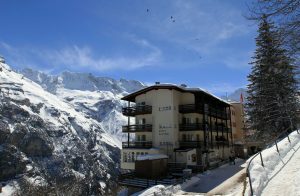 I visited Mürren from March 29 to April 4, 2013 (arriving from Thun) to enjoy some skiing in the Swiss Alps; afterwards, I took a train to Vernazza, Italy to enjoy the Italian Riviera [NOTE: I love vacations where I spend time in two greatly contrasting climates] – but more on that later; what follows are some of the photographs I took while I was in Mürren. 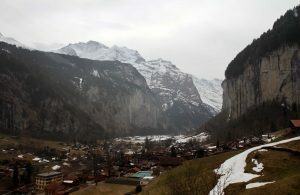 The Lauterbrunnen Valley in the Jungfrau Region of the Bernese Oberland – seen from the village of Mürren. 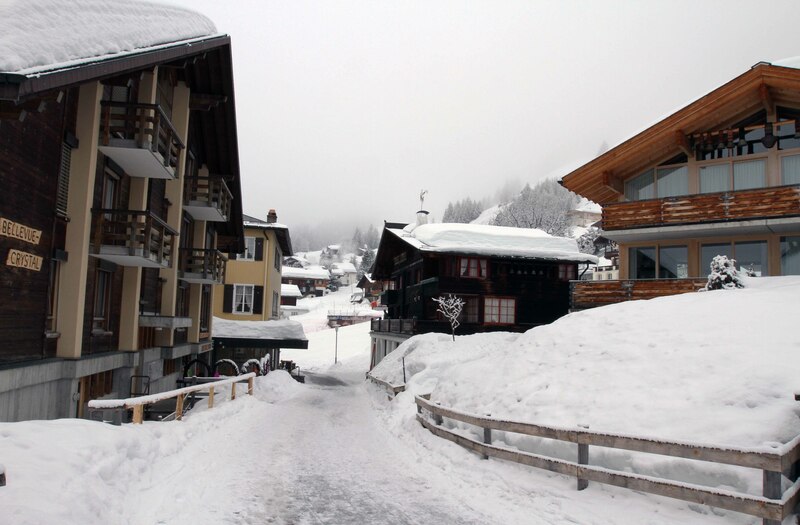 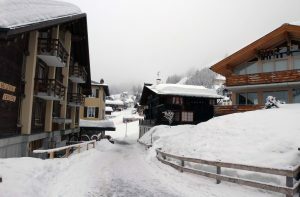 Street in Mürren, a village that is not connected with any roads and therefore has almost no traffic – snowplows and hotel shuttles are the exceptions. 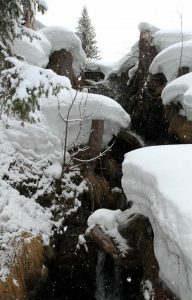 The Mürrenbach stream on the southern end of town. 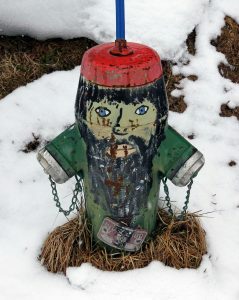 A fire hydrant painted to look like a gnome. 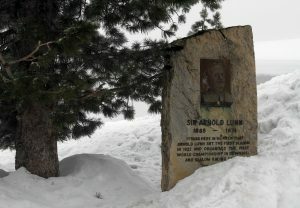 Memorial to Sir Arnold Lunn (a skier, mountaineer, and writer), who developed the rules for the modern slalom and set the first slalom here in Mürren in 1922 AD. 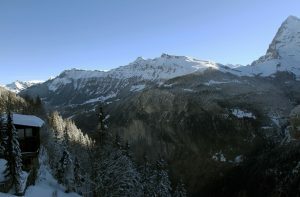 The Lauterbrunnen Valley in the morning. 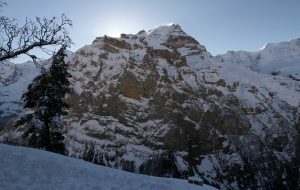 The sun behind Schwarzmönch mountain. 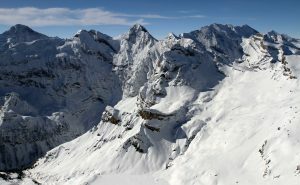 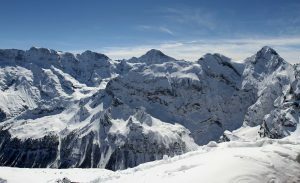 Gspaltenhorn moutain (center), seen from the top of Schilthorn mountain. 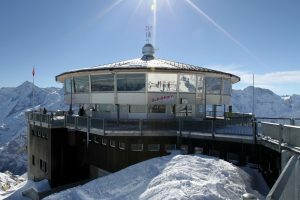 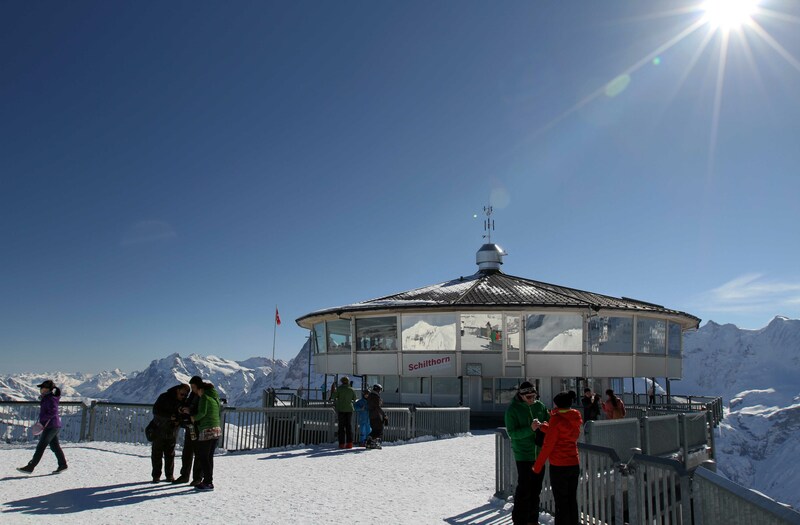 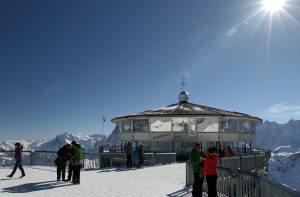 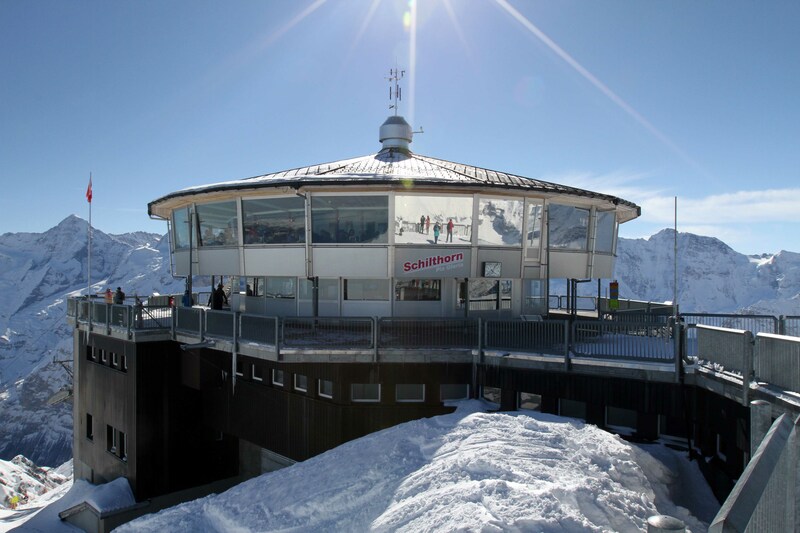 Piz Gloria on the top of Schilthorn. 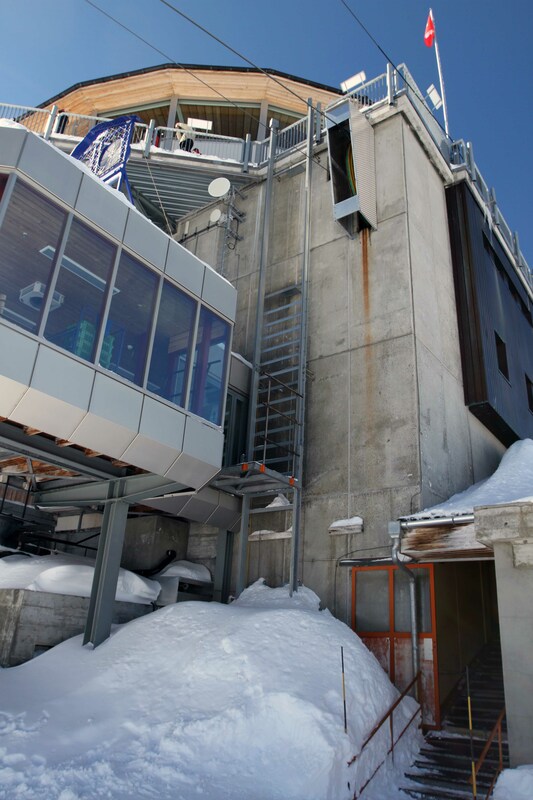 Another view of Piz Gloria, which was once a clinical allergy-research institute headed by Ernst Stavro Blofeld . 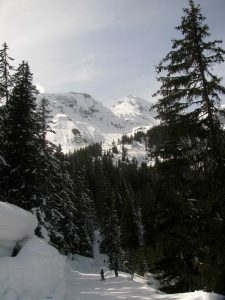 . . or so I’m told. 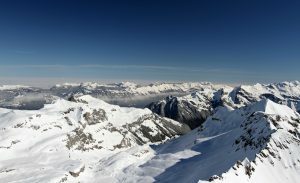 Looking north toward Interlaken, from Piz Gloria. 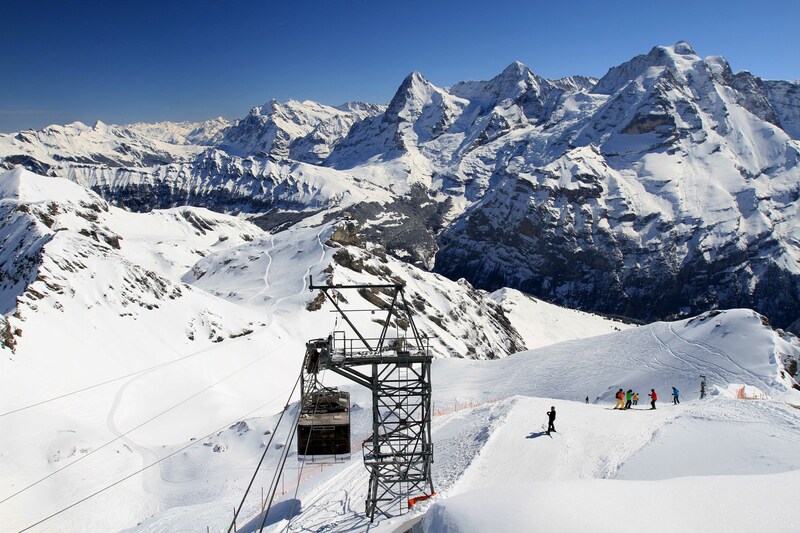 The cable car traveling up to Piz Gloria, skiers beginning their downhill run, and the Eiger, Mönch, and Jungfrau mountains (the three dominant peaks) in the distance. 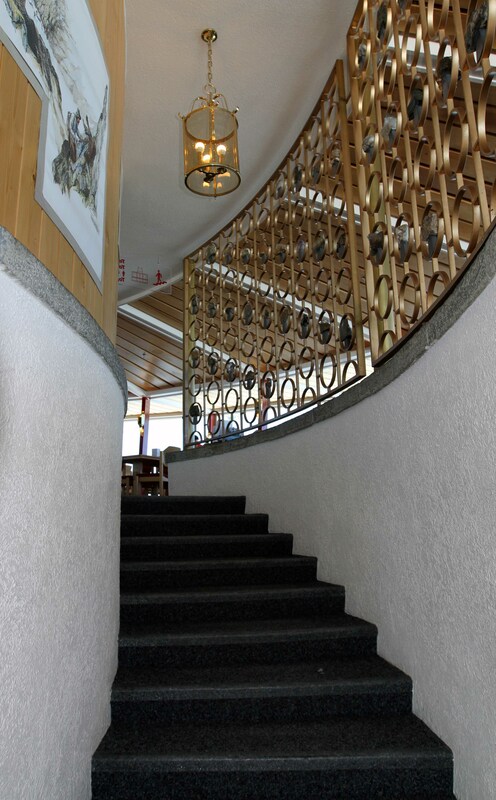 Inside Piz Gloria; these steps lead up to the revolving restaurant where James Bond (a British MI6 agent) dined with Blofeld’s “Angels of Death” . 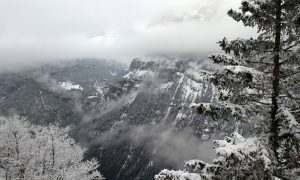 . . or so I’m told. 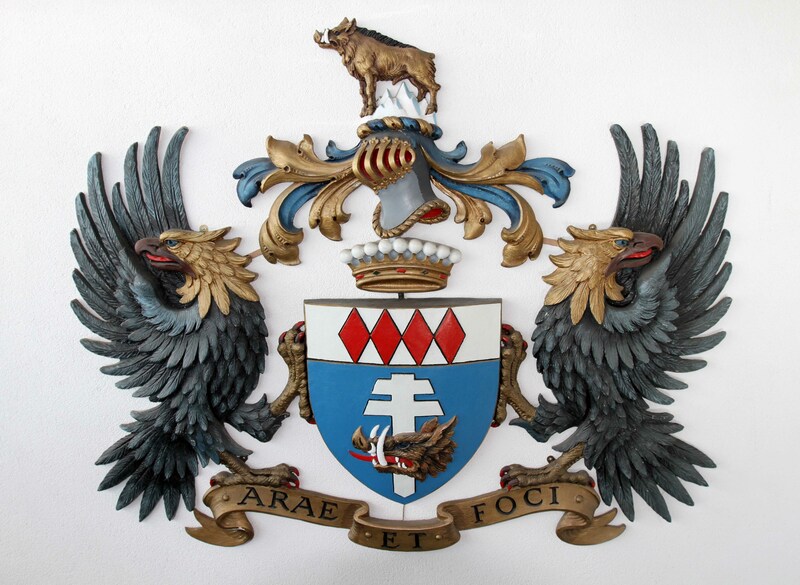 Coat of Arms for the “Comte Balthazar de Bleuchamp” – the title that Ernst Stavro Blofeld had hoped to claim until James Bond foiled his plans . 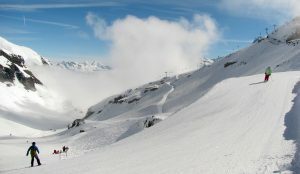 . . or so I’m told. 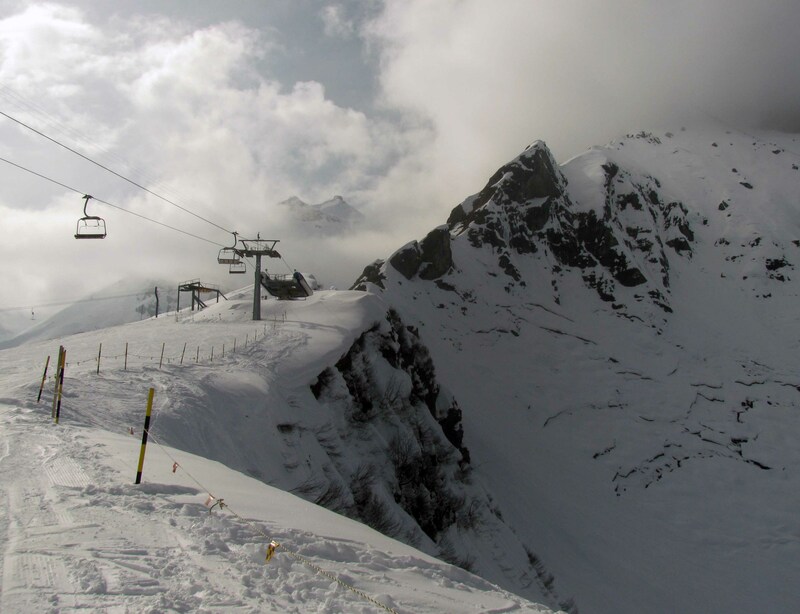 Looking up at Piz Gloria from the beginning of the ski run on the Schilthorn. 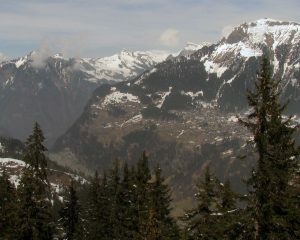 View of the mountains on the far side of the Lauterbrunnen Valley. 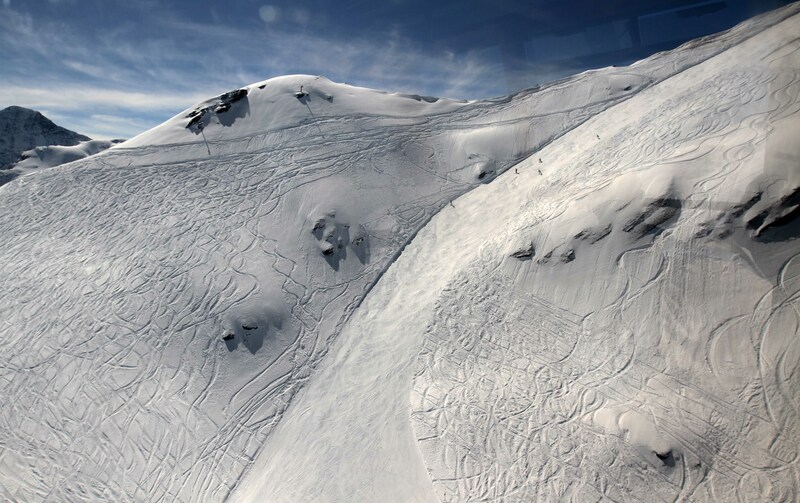 Looking down on the piste near the top of the Schilthorn – seen from the cable car ride between the Schilthorn and Birg. 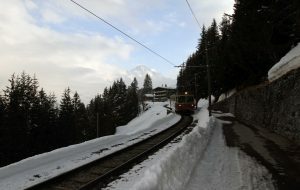 The Seilbahn Mürren Allmendhubel – a funicular that was built in 1912 AD. 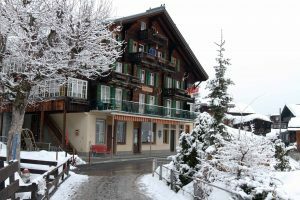 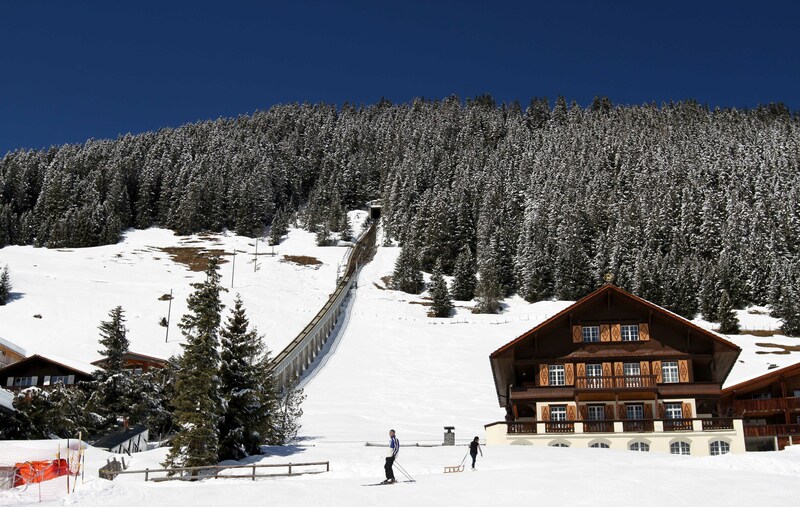 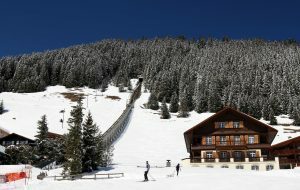 A chalet with Schwarzmönch in the background. 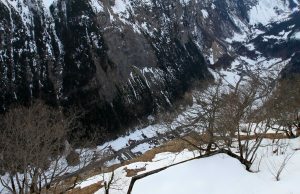 The Hotel Alpina on the edge of the valley cliff. 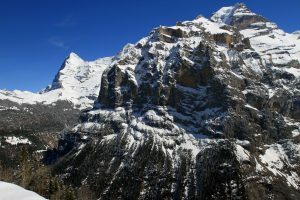 Schwarzmönch and the Eiger seen from Mürren. 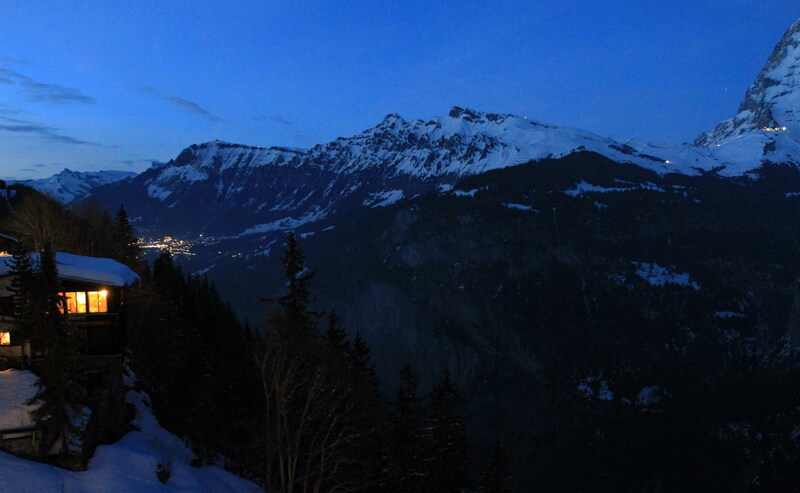 The Lauterbrunnen Valley at night with the village of Wengen’s lights visible in the distance. 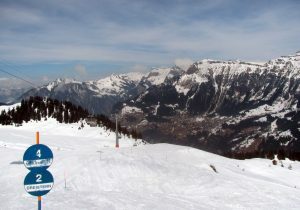 On a piste, ready to ski, with the Birg on the right. 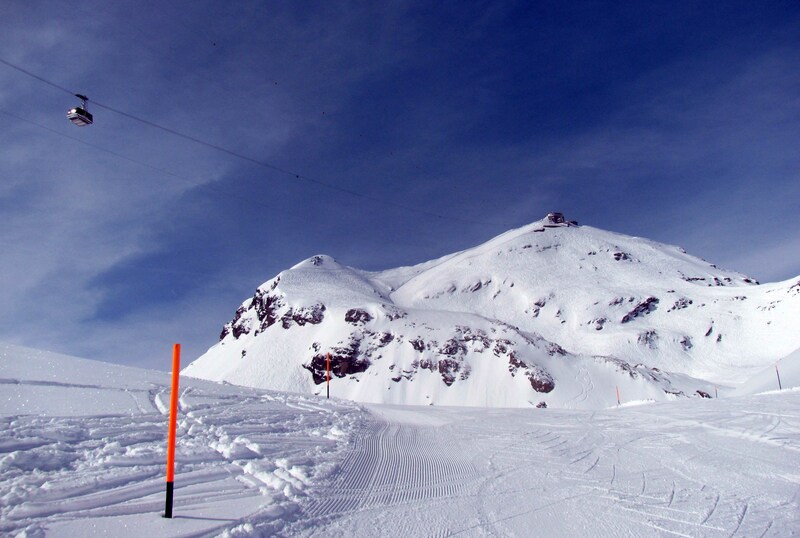 Looking up at Piz Gloria as a cable car makes its way down to the Birg. Alpine huts next to the pistes. Mürren in view with the Eiger on the other side of the valley. 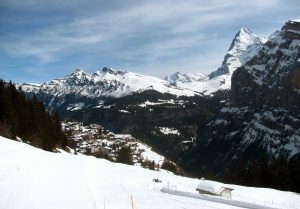 Another view of Mürren and the Eiger. 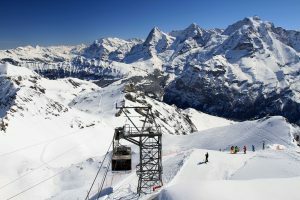 The Winteregg ski lift with the village of Wengen on the other side of the Lauterbrunnen Valley. 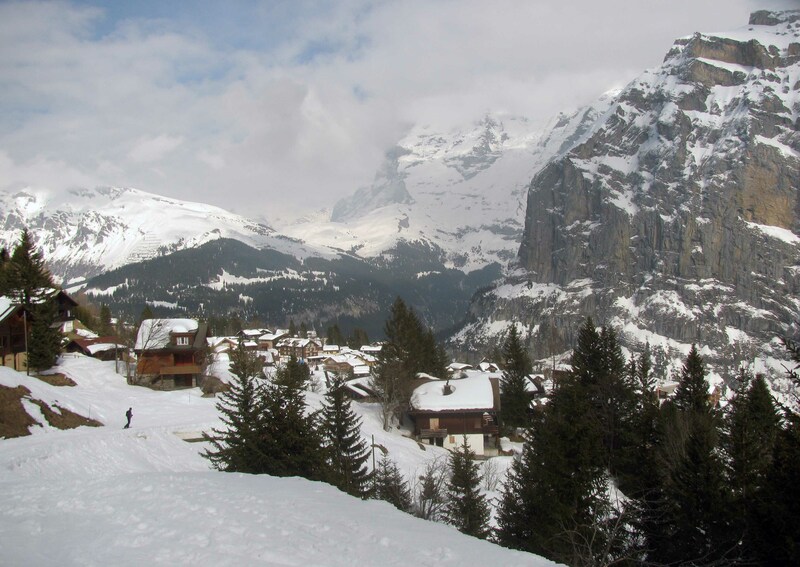 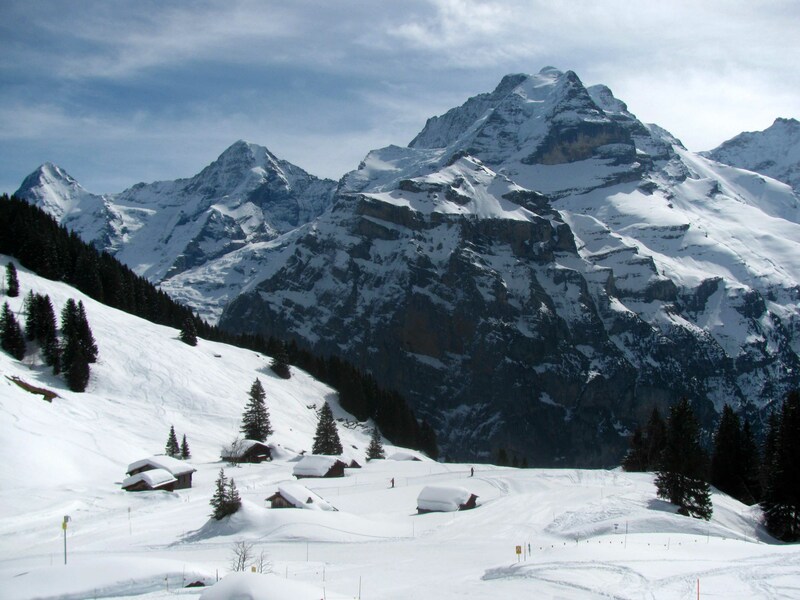 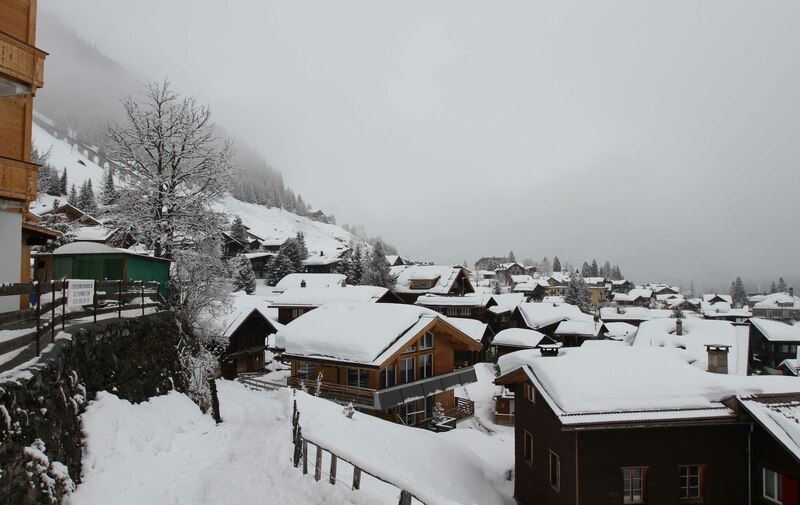 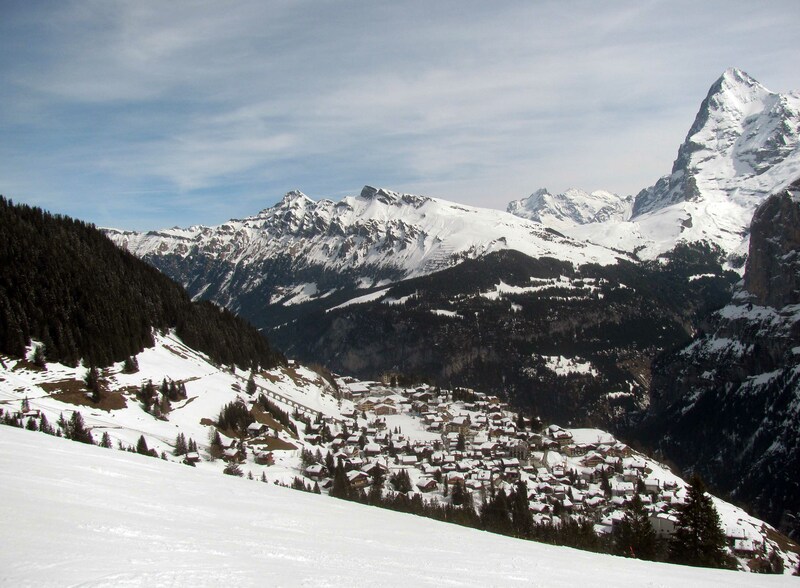 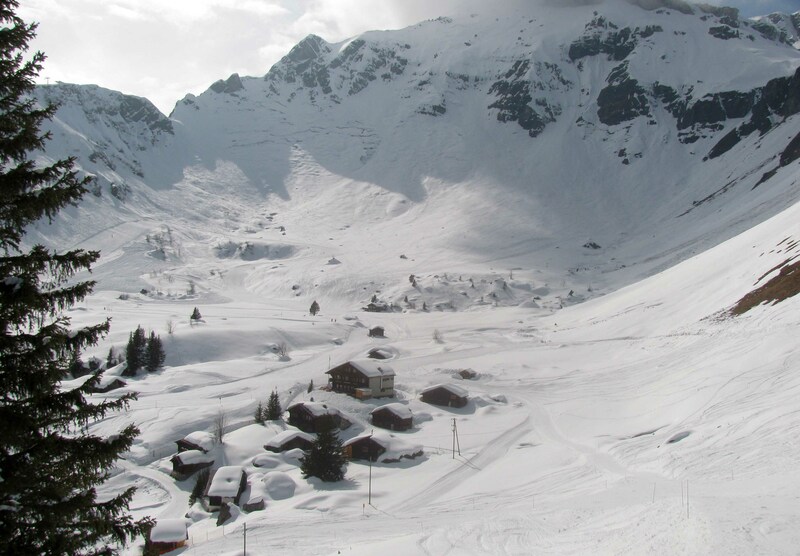 Closer view of Wengen, which is a little deficient in snow this time of year. 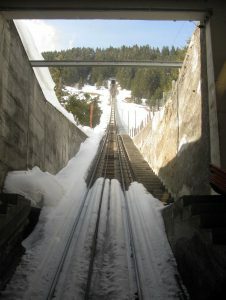 Looking up the track for the Seilbahn Mürren Allmendhubel. 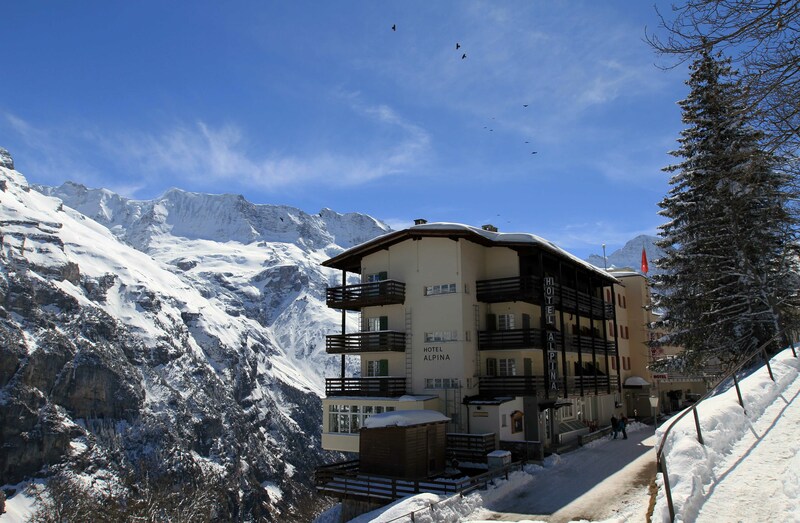 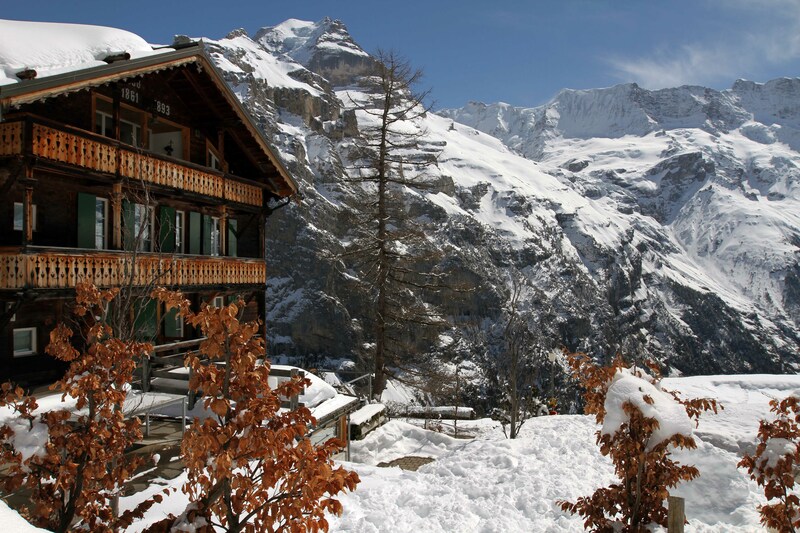 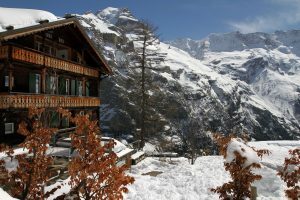 The Pension-Restaurant Sonnenberg and huts at the far end of Mürren. Looking back at the ski lift before continuing on down the piste. 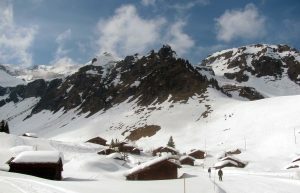 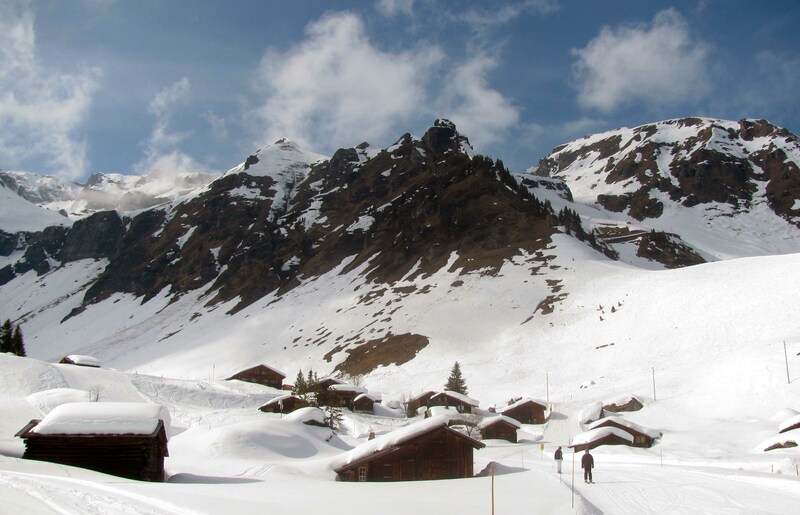 Skiers casually passing between alpine huts. The tracked cable car that runs between Mürren and the Lauterbrunnen-Mürren [suspended] cable car station. 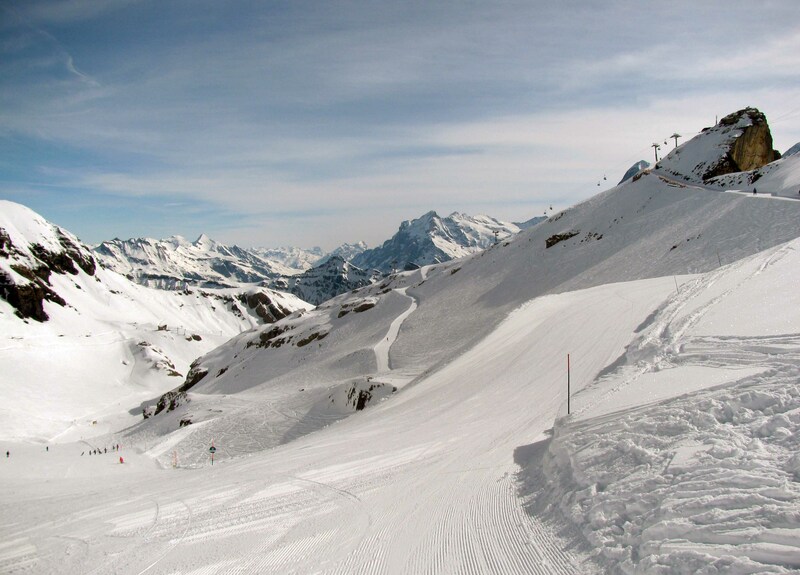 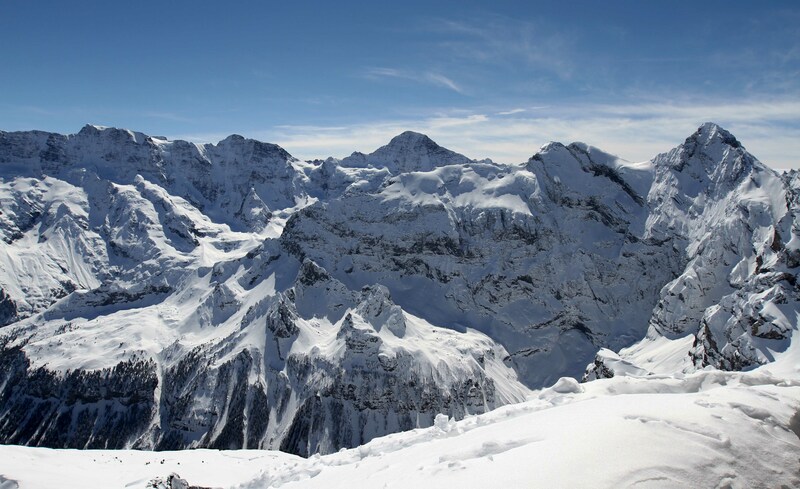 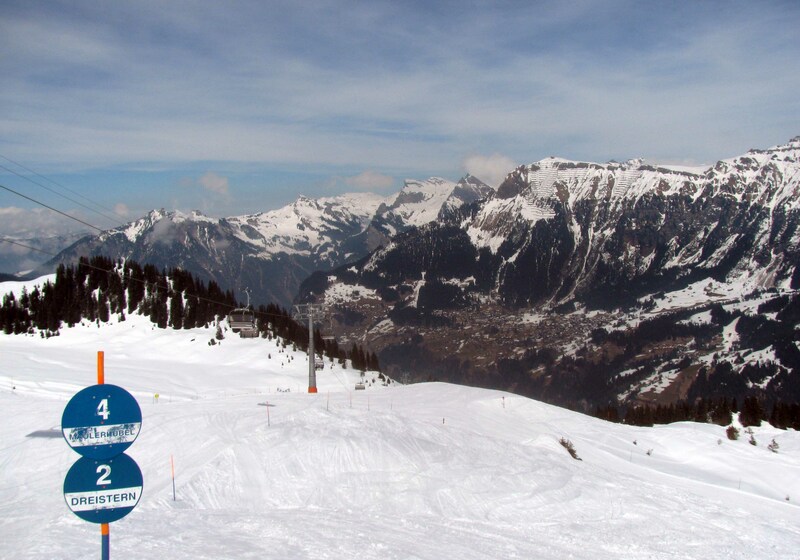 Another glorious day skiing in the Jungfrau Region of the Bernese Oberland. Peering down at the Lauterbrunnen Valley. The valley and town of Lauterbrunnen, seen from the cable car descending down from Mürren.